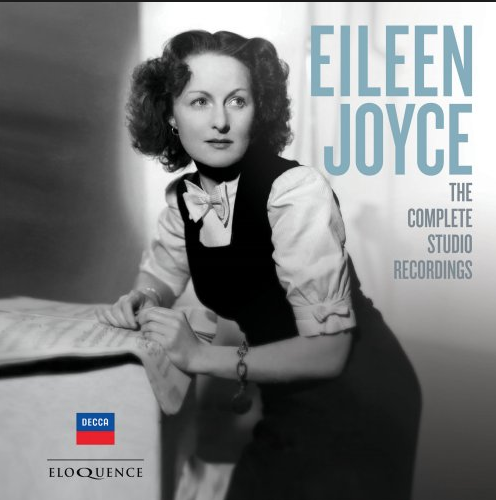 The Australian-based Eloquence label has issued a landmark album: the most complete set of Eileeen Joyce’s recordings ever made available, including a recording of Tchaikovsky’s Second Piano Concerto previously unreleased in any format. Now in a 10CD box, with a comprehensive and richly illustrated booklet, the recordings promise a treasure-trove of exciting discoveries to any pianophile, piano historian, or simply lover of superbly crafted piano playing. The Tasmanian-born Joyce was still a student of the legendary pedagogue Tobias Matthay at the Royal Academy of Music in London when she made her first recording, at her own expense, in June 1933. This was of Liszt’s concert study ‘La leggierezza’, and the Parlophone Company was sufficiently impressed by the recording to purchase it from her and request a side B. So began a 27-year-long recording career, stretching almost to her retirement in 1960. Other large-scale works in the set include the Piano Trio of Arensky, the rarely encountered Ballade of Grieg – a composer of whom Joyce made a specialty – the First Concerto of Shostakovich, the Second of Rachmaninov and the Variations Symphoniques of Franck. But the greater portion of the box allows us to hear Joyce on her own, not only in Classical sonatas by Mozart and Beethoven (including the ‘Pathétique’) but also accounts of Mendelssohn, Chopin and Scriabin which stand out for their dazzling legerdemain.